Best Price Guarantee: If you purchase your tickets via the link provided on this page and find a better price for equivalent Mob Museum tickets, Vegas.com will match the competitor's price and refund the difference. That’s customer care you can count on. The Mob Museum is going to expose you to history that your school textbooks didn't dare to cover. 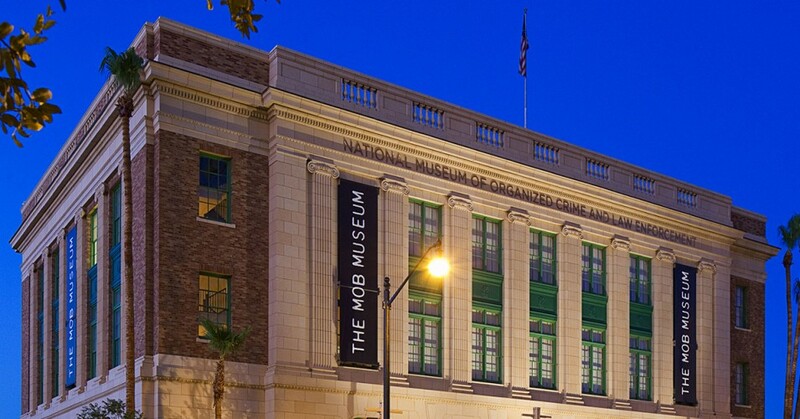 Located in the heart of downtown Las Vegas on Stewart Avenue and Third Street (right by Main Street Station), The Mob Museum is an interactive attraction showcasing the history of these famed gangsters. Here you'll get an inside look at organized crime's impact not only in Las Vegas, but its influence in America and the world. From the same design team that created the Rock and Roll Hall of Fame in Cleveland and the International Spy Museum in Washington D.C., the 41,000-square-foot Mob Museum includes about 16,000 square feet of exhibition space on three floors and more than 1,000 iconic artifacts. It features in-depth exhibits about the mob, myths about the mob, and so much more. Some find mobsters strangely fascinating, while others get excited about the good guys who brought them to their demise. If you're into the law enforcement side, you'll get a chance to read a lot about them, too. One of the key exhibits is the actual courtroom used in the Kefauver hearings, the first mob-related event to be televised. The museum is located inside the former federal courthouse where the 1950-51 Kefauver Committee hearings were held. The Kefauver Committee investigation contributed to the national debate on organized crime that developed after World War II. The dimly-lit courtroom shows historical clips on a big screen and just outside, you can read more about the hearings. More law enforcement exhibits include a wire-tapping station where you can listen in on actual conversations that happened. See testimonies of FBI agents on audio-visual panel (AVP) screens and even try your aim with an FBI firearms training simulator. There's also a police lineup booth where visitors can step into and be "suspects." If you're all about seeing the bad guys and their dirty deeds, the Mob Museum exposes just that. Read a timeline of the mob, watch an AVP screen on becoming a "made" man, step into a room and learn how a "skim" works, and see a wall explaining where mobsters go once incarcerated. The museum's most valuable artifact is the brick wall from Chicago's Valentine's Day Massacre in 1929. The museum explains the murder of seven Moran gang members led by Al Capone's South Side Italian gang. The wall includes a 38-caliber Colt Detective special revolver, the only gun directly related to the shooting. This gun is believed to have belonged to Moran gang member, Frank Gusenberg. Another object on display is the original barber chair where mobster Albert Anastasia (who was brutally shot and killed while getting a haircut and shave) once sat. Another artifact is an Abercrombie & Fitch leather valise that dates to the 1920s. This valise features a false bottom in which flasks of liquor were once hidden during Prohibition. The museum also carries items that belonged to Al Capone, Charlie Luciano, Meyer Lansky, Benjamin Siegel, Sam Giancana, Frank Rosenthal, Mickey Cohen and Tony Spilotro, among others. Other artifacts include guns, weapons, jewelry, personal belongings and hundreds of photographs. If you're sensitive to gory details, then this museum may not be for you - the attraction showcases weapons and violent photos of deceased mob members found at crime scenes. For those into the glitz and glamour of the mob portrayed in Hollywood, the Mob Museum has you covered. Take a seat in one of the comfy booths in a posh and swanky theater room and see all your favorite clips from various gangster movies. From the archives of the Las Vegas News Bureau, the Mob Musuem features photos of downtown as it appeared in the 1950s. Photos of hotels, local businesses and storefronts comprise this unique collection. The Mob Museum, seen from its days as a federal courthouse and U.S. Post Office, is also part of the exhibition. The enormous gift shop includes all sorts of fun souvenirs, including tuxedo-printed baby onesies. Built in the 1920s, the restored courthouse is one of the city's last remaining historical buildings. The attraction cost approximately $42 million to construct. This museum is culturally friendly by offering audio tours in seven languages, and for all of you out of towners who want to go in a big group of 10 or more, you can get special discounts on guided tour.